Until now I have not really had an insight into how much goes into livestreaming these events, and I thought their overseas participants might enjoy looking at the celebrations from that point of view. My first introduction was to the fundraising effort for the renovation of the Original Shrine, carried on by Schoenstatt.tv. Following two major floods, the structure of the shrine needs to be fully dried out and made more water-resistant, and flood protection has also to be installed. After all, the shrine is at the deepest point of a narrow valley surrounded by mountains. The pews also need to be renovated following water damage and the passing of the years. However, the greatest expense is going to be the installation of new technology to enable Schoenstatters from all over the world to visit the shrine from wherever they are. Because of the depth of the valley, even satellite contact is not perfect, so cables have to be laid between the Original Shrine and the sacristy, where the necessary infrastructure has already been installed. The lighting has also to be improved. So it is well-understood why Schoenstatt-TV commits with the fundraising for the technical equipment. So Mrs Hilde Hug and I (the oldies) got the job of asking for one-off donations from all who visited the shrine. 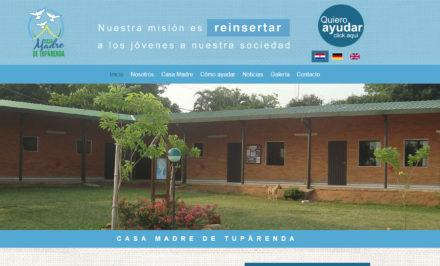 Cards were printed in German, English and Spanish giving the Bank details of a special fund for this purpose. Everyone who donated was given a tiny clothes peg to which a small heart was attached: A heart for the Shrine. Some of you might like to give a larger one-off donation towards the renovation of the Original Shrine. The Bank details are on the card. By 9 a.m. on Wednesday, 12 September, the cars had been loaded with what looked like miles of cables and equipment and parked outside the Pilgrims’ Church. The “Control Centre” had been set up in one of the confessionals, and all cables had to go out from there. To prevent people from tripping up, the cables had to be tracked as far as possible along the walls, and then through the chairs to the points where the different cameras were placed. Each camera had a sound cable and an electrical cable. Once they were in place and had been tested, we had to secure them with tape to the floor, or cover them with mats in the aisles. Holy Mass at 10.30 a.m. stopped all action, and became our Mass for the feast-day. We were glad of the rest! By the time everything was in place and secured, it was lunch time. Straight after lunch the camera crews and technicians had to return to the church to test the whole system out. It was late that evening before the main problems had been ironed out. On Thursday we started even earlier. Cars were parked outside the Adoration Church by 8 a.m. and we began carrying everything into the church. The “Control Centre” was set up near the main electricity board in a corner outside the Father Chapel. From there cables had to be laid to all four corners of the church and the Founder Chapel, including the sound-proof cabins for the translators. Can you imagine how long those cables were? Again every care had to be taken to ensure that no one would trip over the cables. I became aware of what all this equipment must have cost and wondered how the Hug family have financed it all (they do so via donations, editor’s note). The men were busy putting up the stands for the large monitors outside the church, and we had to get cables there as well. Just in front of the large MTA picture in the church there was a forest of stands for the microphones for the choir. All these cables were connected to a huge control panel just in front of the first pew. That day we had a picnic lunch outside the church, then the work and testing continued until late in the night. We “oldies” went home as our work was done by mid-afternoon. The professionals got very little sleep. On Friday a further problem arose, because the satellite dish bought for 2014 could not be used. I am not sure how that problem was solved, but a solution must have been found, because everyone was able to follow what was happening in the Pilgrims’ Church. My friends worked again until late in the night. 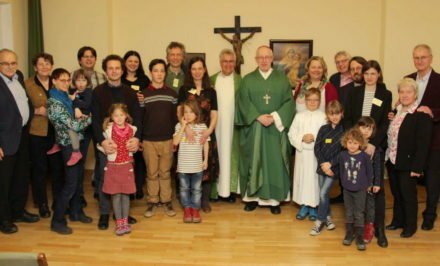 On 15th September we had breakfast shortly after 5 a.m. because the cameras and other equipment had to be set up for the 7 a.m. Mass with Auxiliary Bishop Gerber in the Adoration Church. Initially the organisers thought there wouldn’t be too many there, but the church filled to overflowing and the overflow had to be sent down to the auditorium under the church. Everything was transmitted down there as well. At exactly the time Fr Kentenich died there was silence. You could have heard a pin drop. The Mass itself was celebrated at the same time as he had offered Mass on 15 September 1968. It was only afterwards that we worked out that this was possible because summer time had not yet been introduced. Immediately after Mass we had to grab the cameras, computers and tripods and race down to the Pilgrims’ Church where the TV team set up again and tested that all was OK. We two “oldies” went as fast as we could to the Original Shrine and began our task of collecting money for the Original Shrine. Once everyone began to move to the church, we packed up our collecting boxes and stowed them safely in the sacristy, and made our way to the church for Mass with Archbishop emeritus Zollitsch. By the time we arrived even the area in front of the church was full and I didn’t think we would find a seat, but Hilde found her husband manning a camera point, and beside him were two seats marked “schoenstatt-tv”. There are perks to any job! After Mass we returned to our collecting boxes and had a quick packed lunch, while the camera team took cameras, computers, etc. back to the Adoration Church for the afternoon celebration. Once the crowds in and around the shrine thinned out, we got a lift up the mountain and found our seats for the afternoon celebration. Once again the church was filled to overflowing, with the overflow down in the auditorium, and outside the church where they could follow everything on the monitors. We were kept praying that nothing untoward would happen, and our Mother cared perfectly. Once the crowds had left the church our work began. We had to collect all the cables and equipment. We learnt that each cable, all 50 metres or more, had to be carefully rolled up in such a way that it could be used immediately the next time without tangles or problems. Each cable had to be secured, and the borrowed cables set aside to be returned. We got home after 9 p.m. that night, too tired for words. But also happy and grateful that all had gone so well. Agathe conjured up supper! We learnt that the camera crews hadn’t eaten since breakfast. For Sunday there was only the Pontifical High Mass with Cardinal Marx, the President of the German Bishops’ Conference, who had come especially from their meeting in Poland. While the camera crews set up in the Pilgrims’ Church we continued collecting for the Original Shrine. To my surprise the Cardinal arrived all on his own and spent quite some time standing in the door of the shrine, because Mass was being said for a Portuguese group that was going to Gymnich. In his sermon he reminded us that he had been the Bishop of Trier before he was moved to Munich and became Cardinal, so he knew Schoenstatt well. After Mass the camera crew had to rush up to the Kentenich House for the reception with the Cardinal, and we “oldies” were told to go home and get lunch. 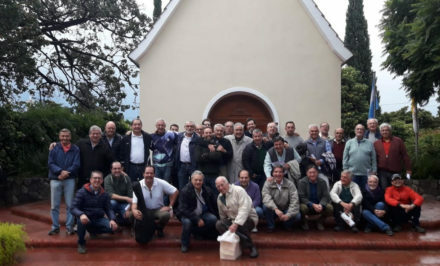 The Brothers of Mary kindly collected the cables in the Pilgrims’ Church. Mr & Mrs Hug had to go home to Southern Germany that afternoon, because on Monday they had to start harvesting the grapes that would make the new wine. 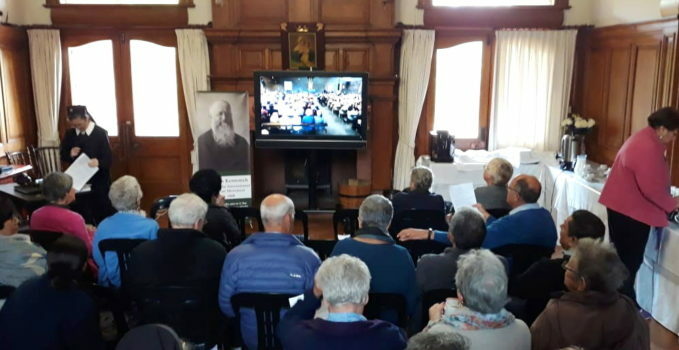 It made me all the more aware that schoenstatt-tv is the work of volunteers who have busy working lives the rest of the time. 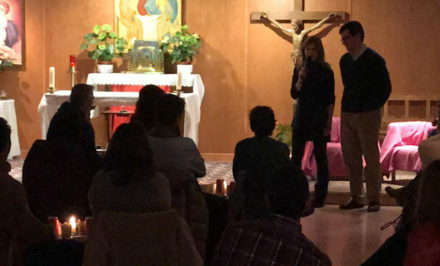 After this experience I will appreciate everything that comes from schoenstatt-tv far more. It is a work of love. Only God and his Mother can reward those involved. 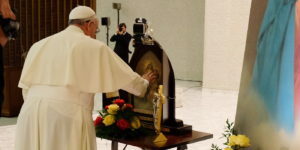 The records of the live transmissions are available at the so-called “mediathek” at schoenstatt-tv.de. 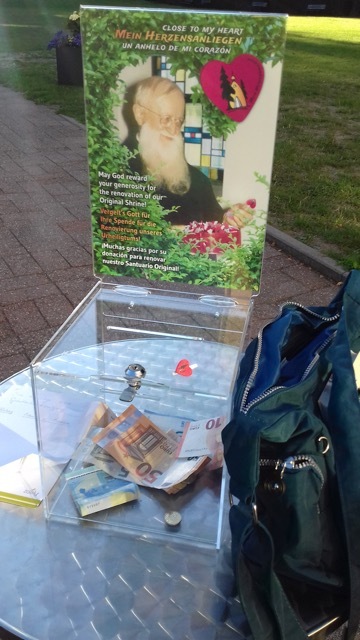 There you also find the accounts for donations for Schoenstatt-TV.